Absolutely Gorgeous 2 bedroom/ 2 bath 1200 square foot Non Smoking Condo on the 4th Floor of The Barclay Beach Club, North Hutchinson Island , Ft. Pierce Fl. Just south of Vero Beach. Just north of 1.5 miles of State Park undeveloped beach. Active Turtle Nesting Site. Completely Renovated in 2005 with marble tile throughout a professionally decorated vacation home. New appliances, washer/dryer, entertainment center and balcony furniture that will provide all the comforts of an upscale home away from home. Your vacation will start as soon as you walk into the 3000 square foot marbled lobby and ride the interior elevator to Unit 403. The foyer will greet you into an eat-in kitchen with brushed stainless appliances, trimmed in black and surrounded by granite. The living room, with ocean views from the giant terracotta couch and modern recliner, provides a perfect setting to watch the waves or the Sat TV, VCR, or DVD. You can also just listen to a CD or visit at the kitchen pass through bar or use the high speed internet service. We are a professinal couple who live 30 minutes west of town. We use the condo for a summer weekend get away and rent it during the winter season. Our tenants are typically 'over 50' couples. Since we, too, meet that criteria, we have furnished the unit to be luxurious, simple and romantic. We live close by; we are not absent landlords and can help you with local knowledge and advice. My wife or I will meet you upon your arrival or shortly after you arrive through a coded door access, and show you around the complex and the unit. Within an hour of your arrival you can be napping in the four poster king bamboo bed or walking on the beach, or working out in the condo's gym or playing pool in the game room or swimming laps in the huge heated pool or just sitting in the Jacuzzi. It's a great location, directly on a wide, uncrowded beach. It's close to great fishing, boating, shopping and surfing. Vero Beach and Ft. Pierce restaurants are less than 15 minutes by car. You can ride a bike on the beach 15 miles north and 2 miles south at low tide. Limited shopping and restaurants are also within walking distance. Premium accomodations in a first class condominium with all the amenities of a first class hotel. Giant Heated Pool and jacuzzi; Private walkway to beach. The description as well as the photographs provided by the owners of this property and reflected by the VRBO website are accurate in every way. Prior to leasing the property and leading up to our arrival, the owners who are both top professionals were extremely patient and helpful, answering any and all questions. The condo does not "feel" like some having certain rental property compromises but instead appears to be the owners' very well-decorated and furnished home. The Barclay is primarily comprised of full-time residents and we met many extraordinarily nice people. They have a strong and active Homeowners Association and take great pride in managing and maintaining their building and grounds, and made us feel completely welcome to visit. 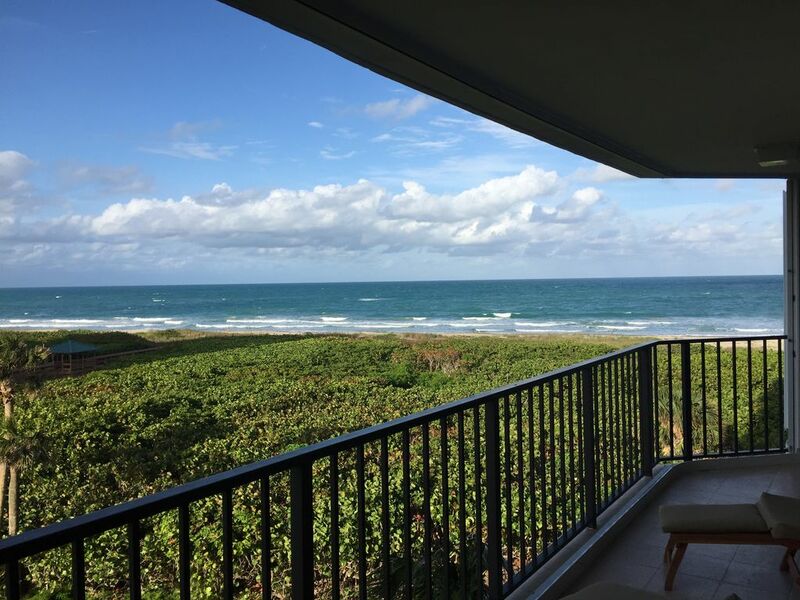 The building is located at the lower end of North Hutchinson Island, where the shoreline has benefited by sand accretion over the years This has made it an outstanding beach for walking, swimming, diving, fishing, surfing or just plain relaxing. We stayed during the winter and the weather was splendid. It is only a short drive to obtain the necessities of every day. We especially appreciated the Saturday morning Farmers' Market in downtown Fort Pierce, as well as Chuck's Seafood Restaurant and Buoy 12A - both very casual with outstanding seafood. Pelican Seafood is a long-time, excellent provider of fresh fish and accompaniments to the public as well as local restaurants. Vero Beach is a pleasant 12-mile cruise up A1A and there we found great shopping and a wide range of excellent restaurants. In summary, we highly recommend your consideration of this property and know you will not be disappointed. My husband and I stayed here a few years ago and were able to come back this past winter season. The weather, location, and condo were better than we remembered. The unit is very modern and romantic with a great view. It's big enough to have all the space a couple needs with two bedrooms, two baths and a great walk in closet area; it was also very clean and was easy to keep it that way because of the marble floors and the inside carpeted entrance way off the elevator. The living room is very comfortable for watching all the games and you won't want to get out of the four poster bed. The owner met us at the unit and showed us around. This was helpful and gave us some direction for exploring. Explore the nearby waterfront walks in Ft. Pierce , Stuart and Vero Beach and definitely walk the beach southward every day around low tide. The area south is in a State park . We made several day trips. Cape Kennedy was an hour drive along the beach. Disney is only an hour and a half away and West Palm Beach is less than an hour. Ft. Pierce Fl. North Hutchinson Island.